Having a new piano that we can see from all angles of our living spaces just makes me think of Christmas, hence the "On the First Day of Christmas" kind of title. And God is surprising us with so many blessings right now that it is as if they are just pouring down on us, like a flooding rain after a years of drought! It has been discussed with the Princess that besides playing in restaurants on the weekends she can, that she could also take on a young piano student or two. It would not be as much as she can make per hour in tips, but it would be steady and the rewards of teaching would be so worth it, because she will get so much in return. Of course, she does not know this yet, not having the experience. She has not really allowed herself to love to play again like she did when she was younger, but the new grand piano we think will help. What has most motivated her of late is making money at playing the piano and competing. Her piano teacher told me that when she was in college for music, one of her professors told her that she needed to take on a few students during the summer. I cannot imagine this now, but apparently she simply hated that idea. She had no patience and it grated on her every time a child would hit a wrong note. However, at some point that changed for her and she found that she loved teaching and she had an incredible amount of patience. Then, just as we met, she found that she had a particular gift with teaching very young students that she did not even know she had previously. In fact, most of the parents of younger students have told me that she was referred to them by another piano teacher who would not take younger students or that she was the only teacher they could find that would take a younger student. My Princess was the very youngest she had ever and has yet ever taken, although there is one boy who started just a month in age later than she was and he went slow, until he could play a bit of jazz. My reasoning for the Princess teaching is that when your own eyes are weary, seeing through another's young eyes can be renewing. Hearing the music she used to play and watching a child progress might be encouraging to her. Also, she will have to teach theory, ear training, and technique. The Princess has wonderful technique, but she has forgotten (or thinks she has) most of the music theory she learned and used to struggle with ear training. I always found that I learned more and it lasted better when I was teaching it and I used to teach the Princess music theory and ear training between her lessons, so I am hoping that works for the Princess. I was talking to a friend and former neighbor, who moved about 25 minutes south and west of us and finally got back from visiting family in California, about how the Princess may be looking for two young students and she asked how much she was going to charge. We had been discussing it, so the Princess felt that $10 for each 30 minute lesson would be good. I was thinking more like $12 to $15, but since this is her first teaching experience, $10 probably is a good starting point. Experienced musicians and teachers charge around $80-$100 a month for 30-minute lessons. My friend immediately wanted her 9-year-old daughter to take lessons under the Princess and her 6-year-old nephew has been wanting to learn piano also. I was hoping for 4 to 7 in age, but we know the the girl so it will probably work out. Yesterday we both poured over the books she had used and searched online. I talked to her piano teacher telling her that we have gone from "she (her teacher) and I both thought this is a good idea" to "she (the Princess) has two students so she is doing this. Aaaaah!" This family has been looking for a piano teacher and there are just none around them. They are probably 90 minutes away from Trudy so there is no competition and Trudy is glad to help. Since we missed a couple of lessons due to the competition and illness of late, I asked if we could come 30 minutes early next week so that she could go over what the Princess would cover in the first lessons. The Princess began younger so she had started with different books than neither one of these children will. She moved into both the series they will start with, but she moved into higher levels. So she never did the first books of the Alfred's Prep Course like the boy will probably need, because Music for Little Mozarts covered much of it, just slower paced for young students. She did not do the first books of the next level Alfred's Basic Piano Library, because it was covered in the Prep Course. I suggested that she first start them on the digital piano and make the grand or the upright if we still have it, a kind of reward for sitting right (and not kicking). This will give us time to get our minds wrapped around the best way work this all out with the pianos. Piano rich and space poor, but it is what it is. Speaking of the upright, since the Princess has two students, my husband suggested that maybe we do not sell it, but move it to the basement. That would less distracting for them and allow us to have our living space, because as it is right now, the pianos are in the middle of our living room and the digital is in the dining room, but we had plans for it to go into the hideout room once the Princess moves her clothes and sleeps in the current guest room...and, no, we are not ready for that yet. There is no place to escape to for the rest of us so this is the new plan and I already took off our listing on Craigslist. 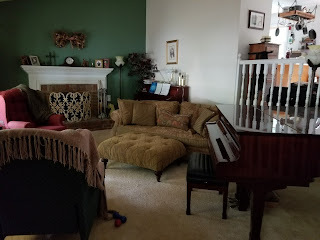 However, the downstairs is cluttered with homeschool stuff, my husband's work and hunting stuff, and a desk that needs to be moved upstairs to the hideout room (that needs repainted) along with bin containers filled from the Queen Mother's house. We all need a real vacation but instead we need to use vacation time to clean up all together. I will say thank you, my Lord, that closing went through yesterday so that is the last we have to worry about the house in Florida. My Lord, so much going on. Some coming to a close and some new things cropping up. Keep us on that path You have prepared for us and help my daughter really love music more deeply than she ever has. Wonderful that everything is so falling into place. I remember Cait taking on a cello student [she played violin. not cello] & saying, well, it's just a big violin & he has a book... she stayed about a lesson ahead of him & he did really well with her but it was excellent for her. She learnt a lot about how kids learn & music theory.